EISA supported the strengthening and revitalisation of national and local structures within the three parliamentary parties, namely, FRELIMO, RENAMO and MDM, and the fulfilment of their internal party democracy requirements such as the holding of national statutory meetings. EISA also supported the capacitation of MPs for the fulfilment of their legislative and oversight function, specifically in the analysis and discussion of state budget and public accounts actively promoted increased women and youth participation within their political party's through training of women and youth league members. EISA Mozambique contributed to the dissemination of policy and organisational directives that emanated from FRELIMO's 11th Congress, which took place in September 2017. This was done through support to the party's national meeting of district structures, held in Inhassoro district from 15 to 16 December 2017. The meeting, attended by 362 people, served as an experience-sharing, lesson-learning and methodology-harmonisation opportunity, and was also attended by the party President, the Political Commission, the National Secretariat, and all 11 Provincial Secretaries. In the same period EISA Mozambique also contributed to the MDM party internal democratic process through support to their 2nd Congress, which met in Nampula city from 5 to 8 December 2017, with 1,500 delegates, who represented every province. The Congress discussed party policy matters and elected the members of the party leadership organs. The party President, Daviz Simango, was re-elected party leader. EISA Mozambique supported the capacity of Renamo Members of Parliament to analyse the Annual Social and Economic Plan and Budget proposed by Cabinet for 2018, through a 2-day training of 60 MPs and 12 caucus staff members on 24-25 November 2017 in Maputo. EISA contributed to the strengthening of FRELIMO structures through the conduct of 2-day induction training of the new 189 members of the FRELIMO Central Committee, elected at the party's September national Congress, in Nampula city in October. EISA contributed to the revitalisation of national party local structures within MDM through the training of 216 MDM national and provincial cadres, in Beira in September, in preparation for the party's national congress, scheduled for December 2017. EISA contributed to RENAMO provincial structure building, specifically through support to the election of RENAMO's new provincial office bearers in all 11 provinces through provincial party conferences, which took place in all provincial capitals in September, with the participation of a total of 1,710 delegates from every district in the country. the role and engagement of the WL in party activity. EISA Mozambique supported a two-day training in the city of Beira in May for 1480 members of the MDSM party Youth League. The training focused on internal organisational issues, including strategies to increase the participation of female members in the League's decision-making process; leadership and communication skills; outreach strategies to grassroots structures and non-partisan youth groups; and the role and engagement of party youth in the monitoring of public policy and public interest. Activities in 2016, which were aimed at strengthening political parties and elected bodies, focused primarily on training MPs to improve their oversight and legislative capacity, with additional activities targeting internal party structures. EISA supported the training of 25 central-level FRELIMO trainers in electoral matters, using components of the 'Building Resources in Democracy, Governance and Elections' (BRIDGE) methodology, in preparation for training activities in 2017 ahead of the 2018 local elections. EISA supported the training of RENAMO MPs in the state budget process and monitoring and public accounts management. The October training was especially critical as Parliament was preparing to debate and approve the new state budget and the public accounts report of 2015. Participants expressed satisfaction with the content of the training, and requested future training events with a focus on economic issues and women empowerment. EISA supported a two-day training event for the 17 members of MDM parliamentary bench, together with representatives from the MDM party benches in all 14 municipal assemblies in southern Mozambique as well as MDM representatives in the the three southern Mozambique provincial assemblies, and MDM party officials in the same regions. Training focused on Budget Analysis and Law-Making, and was delivered by two senior MDM MPs with backgrounds in Public Finances and Legislative Development. A total of 63 people were trained, of which 12 were women. EISA Mozambique supported the training of 60 of the 89 RENAMO MPs on State Budget Monitoring, on 6 June. The training was delivered by a senior representative of the civil society Budget Monitoring Initiative. Sixteen of the participants were women. October EISA supported the training of RENAMO MPs in the state budget process and monitoring and public accounts management. The October training was especially critical as Parliament was preparing to debate and approve the new state budget and the public accounts report of 2015. The same type of training was extended to the 17 MPs from the Democratic Movement of Mozambique (MDM), who were joined by their colleagues in the three provincial assemblies and 14 municipal assemblies in southern Mozambique. At the beginning of 2015 the EISA Mozambique office held meetings with the three political parties represented in Parliament to determine the types of assistance their structures and elected representatives would require. On the basis of these meetings a plan of support was designed for each party. Both FRELIMO and RENAMO submitted proposals for training and assistance. By year end MDN had yet to submit their proposal. However, EISA also supported the interactions and exchanges with parties in Tanzania, Portugal, France, Italy, Belgium, and the Netherlands, with which MDM has ideological, political and working relationships. During these exchanges the MDM leadership observed the elections in Tanzania and interacted with the party benches of the sister parties in their respective parliaments to learn about the legislative approaches of opposition parties and to strengthen the cooperation among them. EISA also supported a training event for the RENAMO parliamentary bench in December, where 65 RENAMO MPs (73% of the bench) were trained by RENAMO communication experts on internal party communication, political communication and voter outreach. About 25% of participants were women. EISA supported the training of the new 120 Central Committee members of FRELIMO's Youth League, Mozambican Youth Organization (OJM), who had been elected in their November 2015 Congress. The training took place from 30 November to 2 December, and 40% of participants were women. The training for FRELIMO elected public officials at provincial and municipal level took place in all provincial capitals between 25 and 30 May. EISA continued to provide support to the three Mozambican political parties with seats in parliament, namely FRELIMO, RENAMO and MDM. 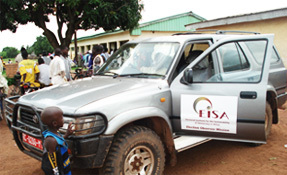 In 2013, EISA's support to political parties, was provided primarily through funding for training and technical assistance. The training focused primarily on providing the parties with capacity to monitor the electoral process. Eleven central-level trainers and 60 province-level trainers for party election monitoring were trained in Maputo and in each province in September. These trainers were in charge of training all FRELIMO election monitors for the 53 municipal elections scheduled for 20 November 2013. With EISA's support, FRELIMO was able to have trained trainers in every municipality who in turn delivered training to their peers locally. EISA supported the training of 1,000 MDM party agents in 12 municipalities. This allowed the party to have fully-trained party agents in all polling stations in those municipalities. The party acknowledged that this training increased significantly the party's ability to monitor the elections at the polling station level, and contributed decisively to improve the quality of the party agents' performance as compared to previous elections. EISA supported an extraordinary meeting of the 60-member RENAMO National Council in the central province of Sofala, in September 2013, where the political crisis in Mozambique was discussed. This activity was linked to efforts by civil society to find a negotiated solution to the political and military crisis between the Government and RENAMO. EISA further played a role in supporting shuttle-diplomacy efforts in July and August 2013. Civil society representatives shuttled between Maputo and the RENAMO headquarters in Sofala province to discuss proposals for a resolution of the crisis. The outcome of this effort was an agreement by RENAMO to streamline the number and scope of its demands. Unfortunately, these diplomatic efforts were derailed by armed action from both sides. FRELOMO, RENAMO and MDM, received technical assistance from EISA with the aim of strengthening the parties' internal capacity and democracy. Preparations for the party's 10th Congress, scheduled for September 2012. Between April and June EISA supported provincial party meetings in five of the country's eleven provinces, with a total of 1,775 participants, to elect the provincial delegates to the party Congress. In August, EISA supported preparatory meetings for the Congress involving all party provincial Secretaries for organizations and Training. In the post-Congress phase, EISA supported a major national training event, involving 250 national and provincial Secretaries, as well as the leadership of the party's women's, youth and veterans leagues, in December 2012, where the Congress's decisions were disseminated and analysed. The training of 500 party activists at district level in February 2012, as part of a process of revitalization of the party's district structures. A meeting of 78 senior RENAMO officials in August 2012 to discuss the party's participation in the 2013 municipal elections, as well as to analyse the mid-year reports from the party's provincial structures. A party leadership meeting to approve the documents and policies to be submitted to the party Congress, scheduled for 5-8 December. The party's first Congress, since the party's creation in 2009. The Congress was attended by more than 700 delegates from all the country's provinces, the party's leadership structures were elected and party strategies were approved for the upcoming 2013 municipal and 2014 national elections. The internal capacity of these three political parties has been strengthened through the training of 765 party officials and activists. Their internal democracy was strengthened through extensive support for the preparation and election of delegates and the holding of party Congresses, involving more than 2,500 party militants. During 2011, EISA provided support to the three Mozambican political parties with seats in parliament, namely FRELIMO, RENAMO and MDM. EISA's support, which is provided primarily through training and technical assistance, aimed at strengthening the parties' internal capacities and their internal democracy. In its political party support programme, EISA motivated the political parties to promote greater gender equality in their capacity-building activities. Around 40% of participants in training supported by EISA were women. Additionally, the political party benchmarks developed by EISA in 2010 with input from dozens of political parties throughout Africa, were translated into Portuguese and are ready to be disseminated in Mozambique. EISA funded the training of around 600 party officials and activists of FRELIMO on matters such as internal party rules and regulations, party programme and policies, electoral processes and information and communications technologies. In addition, EISA also supported the conclusion of the upgrade and update of the party membership database. In its support to RENAMO, EISA funded the revitalisation of the party's district and province-level structures through leadership and policy workshops. Topics addressed in those workshops ranged from the party programme and policies, recruitment and registration strategies, the roles of the Women's and Youth leagues and information on the upcoming electoral processes. More than 440 RENAMO officials and activists were involved in these workshops that took place in every province of the country. EISA funded MDM's capacity to expand at the local level with the training of 200 party district-level activists. After initial contacts to gauge party interest in a partnership with EISA for institutional capacity building assistance, all three parties responded positively. EISA signed Memoranda of Understanding with all three parties and developed initial work plans with each one. This was a very lengthy process given the bureaucratic nature of the internal decision-making process within the parties. Towards the end of 2010, the first party support activities started being implemented, namely two exchange trips for MDM (one of them with financial support from the French and Irish Embassies), and a training event and an upgrade of the membership database for FRELIMO. EISA Mozambique also facilitated a workshop for Mozambican political parties on the benchmarks process ahead and in preparation of the EISA 2010 Symposium. balance and equity in gender representation. The MoU was signed by Ismael Mussa, Secretary General of MDM, and Miguel de Brito, EISA Country Director for Mozambique. Similar MoUs will be signed shortly with the FRELIMO and RENAMO parties. The EISA office, in collaboration with the Netherlands Institute for Multiparty Democracy (NIM D), undertook a research study on party and electoral campaign financing in Mozambique. The study report was subsequently presented at a well-attended workshop, in which all major stakeholders took part. The study, which will be published by NIM D, includes recommendations for improving mechanisms of party and campaign finance in Mozambique.